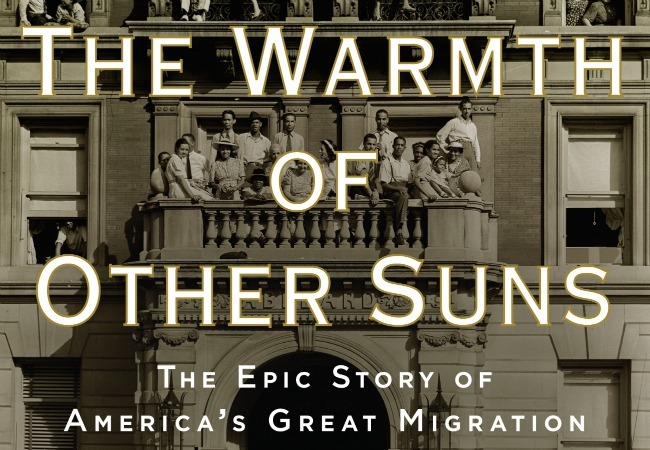 This month, our Twitter book club voted to read Isabel Wilkerson's The Warmth of Other Suns, which narrates mass migration of six million blacks away from segregation and Jim Crow into America's major cities. How do you tell the story of six million people? Wilkerson interviewed more than 1,200 people to find three who migrated at different decades to different cities. Ida Mae Gladney and her husband leave Mississippi sharecropping to settle in Chicago after a cousin is almost beaten to death. George Swanson Starling, high-school valedictorian and orange picker, leaves Florida for New York when he hears that his labor organizing has put him in danger of lynching. Robert Joseph Pershing Foster, who trained as a surgeon at a prestigious black college, leaves Louisiana to establish a successful practice in Los Angeles. Jill Lepore calls this a "deeply affecting, finely crafted and heroic book." Reading ahead, I agree. These personal stories of migration invite us to learn and rethink the issues of the Great Migration with personal empathy. The Warmth of Other Suns has accumulated an astonishing number of awards, including the National Book Critics Circle Award, and was one of the New York Times' Top 10 books for 2010. It's also the 2013-2014 selection for One Book One Chicago, where the city is organising a year of community learning events centered around the book. Joining our Twitter book club is easy. Find a copy of The Warmth of Other Suns, follow us at @1book140, and tweet to join the conversation so we know that you're reading along. To avoid spoilers, we spread the conversation across one hashtag per week. Follow each week's hashtag to see the conversation at that point in the book.